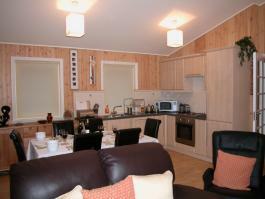 Amber Nook is a purpose built holiday Lodge, recently built among a development of other lodges. There is ample parking for two cars. Outside, the property has the advantage of a large, partially covered, raised veranda to the front, easily accessed by the pair of sliding glass doors from the living area. 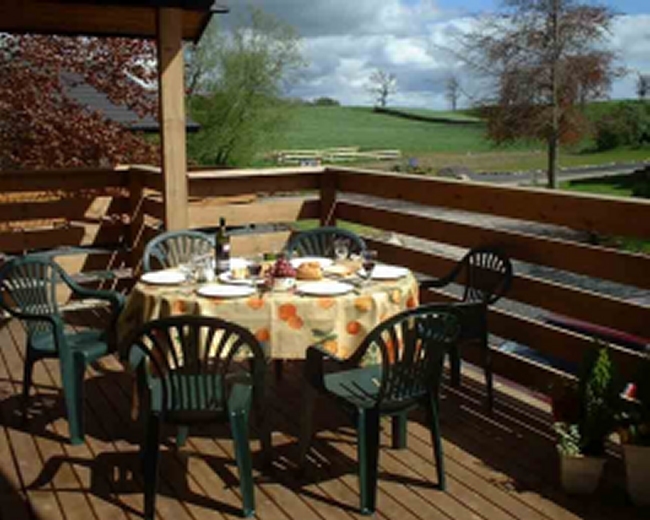 The veranda has views across open fields towards the Pennines. At the rear of the property is a Barbeque area with Chess board. 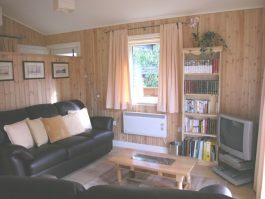 The living area is tasetfully and comfortably furnished, while retaining the "log cabin" feel of a pine lodge. The twin sliding doors which lead on to the veranda give an airy feel to the accomodation and allow views across the fields towards the Pennines. A feature of the living room, and infact the whole lodge is the decor, enhanced by the work of local artists and craftsmen and object d'art in stone, reflecting the Gem and Stone business of the owners. The kitchen area is well equiped for cooking most types of cuisine. Fitted equipment includes fridge/freezer, extractor fan, dish-washer, electric oven and hob. There is also a washer/drier in the lodge. 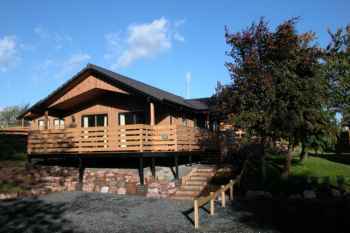 The lodge has a bathroom with over the bath shower and the master bedroom has an ensuite Shower Room with toilet. 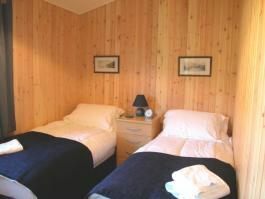 Both rooms have heated towel rails for your comfort. Hotel quality towels are included in the rental. 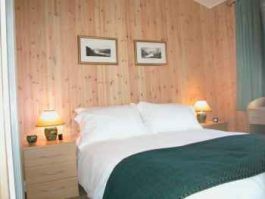 The lodge has two bedrooms; a double ensuite and a twin bedroom. The verandah is a perfect place to relax. The roof extends over much of the area making it a useable outdoor space even when the weather is less than perfect. For those with young children or pets the veranda has a gate which makes the area safely enclosed.The verandah has a wooden bench which converts to a table for alfresco meals. 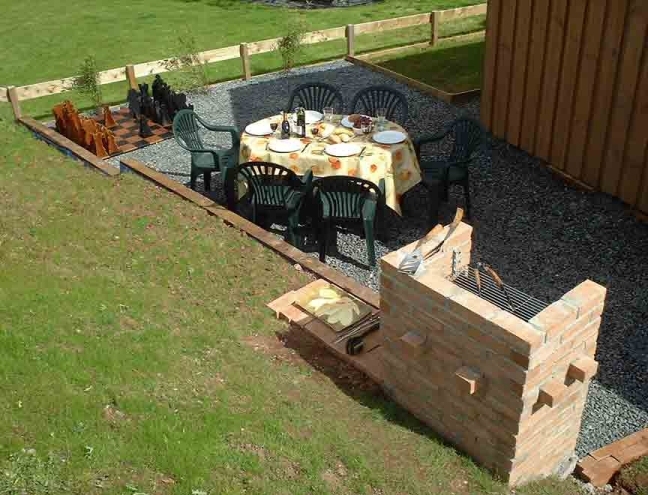 Alternatively, if you prefer, you may use the patio furniture from the barbecue area if you find that more convenient. Visitors with small children or pets may like to close off the verandah from the steps. The gate makes an enclosed, easily supervised space. 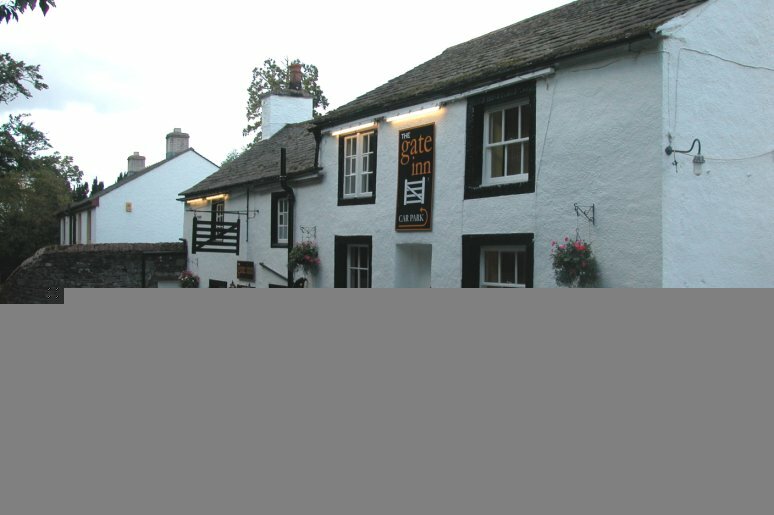 The Yanwath Gate Inn (known locally as Yan'ath Yat) is within easy strolling distance for those looking for company and convivial surroundings. They serve a good range of meals in the restaurant.